- Closed dollar volume $1.916 Billion. 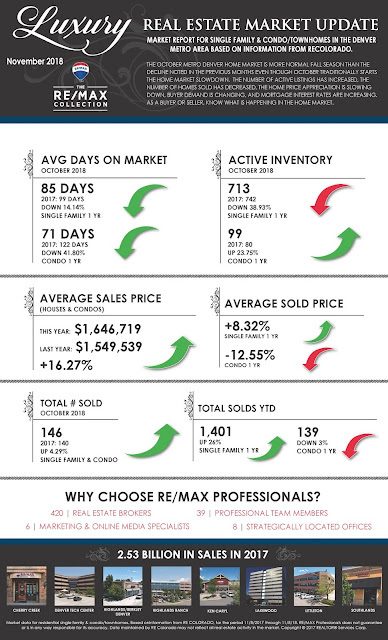 March is out like a lion, Spring is here, the Metro Denver Home Market is improving as Buyers are out in full force. Despite the bomb cyclone and cold weather, the market saw spring picking up. Sellers need to be priced right from the very beginning and make sure the home is move in ready. 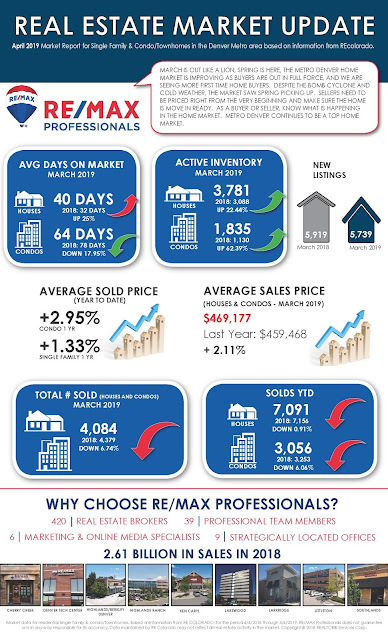 As a Buyer or Seller, know what is happening in the home market. Metro Denver continues to be a top home market. The Metro Denver home market is moving forward with Spring. Think about a Seller Counseling Session. This will demonstrate your home value, set expectations, reduce risk, know what can and cannot do, outline the process, inform you of what Buyers are doing, and provide resources. Learn about the value of renovations and or upgrades, decluttering, and preparing the home. Buyer demand will continue as we see more Buyers in the market. Homes are now taking a little longer to sell and price appreciation is minimal. Buyers always will determine what your home is worth. As a Seller, focus on 2019 and the changes in the home market. As a Seller, your home needs to be priced right from the very beginning. Manage your expectations, make sure your home is move-in ready, be flexible, and accept the offer that works best for you the Seller. Note that Buyers are bringing their A game to the Denver Home Market. Seller preparation includes a good pricing comparison analysis, instructions on staging, what are the top improvements and a conversation on how the market functions. As such, the homeowner looking to sell a home needs a professional who is a local expert, market knowledgeable, and can assist in the Professional plan to sell one’s home. Now is the time to reach out to a Professional. As a Buyer, you will probably see that the home market is moving forward with competing Buyers. Sellers will continue to focus on the sale of their home. First and foremost, focus on your lifestyle and must haves. As a Buyer, be the early bird and get into the home market now. As a Buyer, make the offer that works for you and is the offer that you can complete to close the transaction. As a Buyer, be aware that the mortgage interest rates are not increasing now in 2019. As a Buyer, be prepared to act quickly. The Market is Changing Make Sure you are Prepared! - Closed dollar volume $1.45 Billion. The February Metro Denver home market is definitely seeing a seasonal market pick up with homes on the market, homes closing, moderate price appreciation, and many millennial buyers. Metro Denver is still a highly competitive housing market. Strong job market and gradual decline in mortgage interest rates will continue to usher housing demand. As a Buyer or Seller, know what is happening in the home market and the local, state, and national economy. What should you do if you are ready to sell your home? Think about a Seller Counseling Session. This will demonstrate your home value, set expectations, reduce risk, know what can and cannot do, outline the process, inform you of what Buyers are doing, and provide resources. Learn about the value of renovations and or upgrades. Buyer demand will continue as we see more Buyers in the market. Buyers are now all generation from young age to older age. Homes are now taking a little longer to sell and price appreciation is minimal. Buyers always will determine what your home is worth. As a Seller, focus on 2019 and the changes in the home market. With continued Metro Denver population growth and consumer demand for home ownership, market frenzy is here, and can be expected to continue for several months. Manage your expectations, be flexible, and accept the offer that works best for you the Seller. Seller preparation includes a good pricing comparison analysis, instructions on staging, what are the top improvements, and a conversation on how the market functions. As such, the homeowner looking to sell a home needs a professional who is a local expert, knowledgeable, and can assist in the Professional plan to sell one’s home. Now is the time to reach out to a Professional. As a Buyer, you will probably see that the number of competing Buyers will continue. Sellers will continue to focus on the sale of their home. First and foremost, focus on your lifestyle and must haves. As a Buyer, be the early bird and get into the home market now. As a Buyer, be aware that the mortgage interest rates are not increasing now in 2019. - Closed dollar volume $1.223 Billion. There is always a transition in the January Metro Denver home market as Sellers are bringing homes onto the market and Buyers are ready to buy. 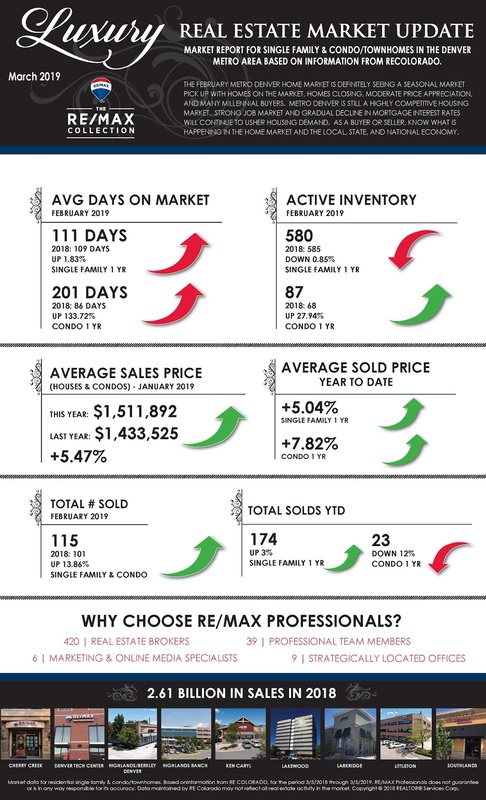 2019 overall will be a Seller’s and/or Buyer’s market. Even though the changes noted in 2018 will continue in 2019, the Metro Denver home market will be beneficial to all. As a Buyer or Seller, know what is happening in the home market and the local, state, and national economy. The Metro Denver 2019 Seller’s home market is here and Sellers should know what will be happening in the market. As a Seller, list your home as the prime home selling season is just around the corner and more important, price your home for the market. Note that comments from several national data base companies state that price appreciation will continue to increase slowly, mortgage interest rate increases will impact Buyers, the inventory of active listings will remain low, current city, state, and national activities will impact our home market, and the overall 2019 Metro Denver Home Market will change from what has taken place in the prior years. Buyer demand will continue. Homes are now taking longer to sell. Buyers always will determine what your home is worth. As a Seller, focus on 2019 and the changes in the home market. As a Buyer, you will probably see that the number of competing Buyers will continue. Sellers will continue to focus on the sale of their home. Sellers know that the market is changing and as a Seller, they will have to consider the changes taking place in the Metro Denver Home Market. As a Buyer, be the early bird and get into the home market now. As a Buyer, make the offer that works for you and is the offer that you can complete to close the transaction. As a Buyer, be aware that the mortgage interest rates will increase again in 2019. As a Buyer, if you do not buy now, in the future you will have less opportunity. As a Buyer, be prepared to act quickly. - Closed dollar volume $1.520 Billion. The Metro Denver home market changed in 2018 and is moving towards a Buyer’s market due to increased inventory, 2019 overall will continue to be a Seller’s market with many Buyers and price appreciation. The last few months have seen the number of active listings decrease, the number of homes sold decrease, home price appreciation slowing down, buyer and seller demand changing, and mortgage interest rates increasing. As a Buyer or Seller, know what is happening in the home market and the local, state, and national economy. The Metro Denver 2018 Seller’s home market is done and Sellers should know what will be happening in the market in 2019. The last several months of 2018 have shown both Seller’s and Buyer’s what will be a different year for the Denver Metro Home Market. Comments from several national data base companies state that price appreciation will continue to increase slowly, mortgage interest rate increases will impact Buyers, the inventory of active listings will remain lower than normal, and the overall 2019 Metro Denver Home Market will change from what has taken place in the prior years. Buyer demand will continue but homes are now taking longer to sell and Buyers always will determine what your home is worth. As a Seller, focus on 2019 and the changes in the home market. As a Buyer, know that the homes available for sale will continue to be low. As a Buyer, you will probably see that the number of Buyers will continue. Sellers will continue to focus on the sale of their home; but, now in a different time frame. Sellers know that the market is changing and as a Seller, they will have to consider the changes taking place in the Metro Denver Home Market. As a Buyer, make the offer that works for you and is the offer that you can complete to close the transaction. As a Buyer, be aware that the mortgage interest rates will increase several times this year in 2019. As a Buyer, if you do not buy now, in the future you will have less opportunity. As a Buyer, be prepared to act quickly. I hope your holiday season is off to a great start and full of laughter and fun. Those of you wishing for a more balanced housing market might be slowly getting what you’re looking for according to the RE/MAX National Housing Report. 1. )Year-Over-Year home sales dropped 4.6% in October - that’s the third month in a row. 2. )Inventory increased for the first time in a decade according to the housing report. 3.) Sales prices in October were one of the lowest increases in 2018. All of this points to better news for buyers this holiday season as the “market moves towards equilibrium” according to Adam Contos, CEO of RE/MAX. If you have a moved planned for the holiday season or want to start preparing for a move in 2019, I’d be happy to meet with you to talk about what you can do now to help begin the process. I hope you have a wonderful holiday season. The October Metro Denver home market is more of a normal fall season than the decline noted in the previous months even though October traditionally starts the home market slowdown. The number of active listings has increased, the number of homes sold has decreased, the home price appreciation is slowing down, buyer demand is changing, and mortgage interest rates are increasing. As a Buyer or Seller, know what is happening in the home market. The Metro Denver Seller’s fall home market is here and Sellers should know what is happening in the market. Active listings have increased. Buyer demand continues. Price appreciation levels are dropping. Interest rates are increasing. Homes are now taking longer to sell. Buyers always will determine what your home is worth. 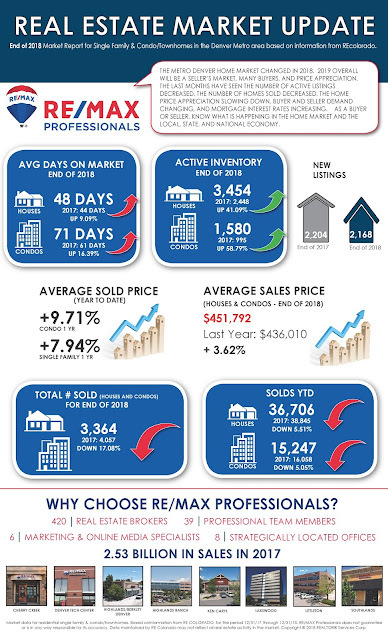 As a Seller, it is time to focus on getting off the fence, knowing what is happening in the home market, what are the home market statistics, and what is your current home value. Be realistic in your outlook and stay focused on the home sale. The Metro Denver home market is seeing a decrease in showings, fewer multiple offers, more homes coming back on the market. and buyers who are cognizant of the home market changes. Manage your expectations, be flexible, be civil, and accept the offer that works best for you the Seller. Seller preparation includes a good pricing comparison analysis, instructions on staging, what are the top improvements and a conversation on how the market functions. As such, the homeowner looking to sell a home needs a professional who is a market expert and can assist in the Professional plan to sell one’s home. The fall Denver home market is here. As a Buyer, know that the homes available for sale will continue to increase. As a Buyer, you will probably see that the number of Buyers will continue to be a high number. Sellers will continue to focus on the sale of their home; but, they know that the market is changing and as a Seller, they will have to consider the changes taking place in the Metro Denver Home Market. As a Buyer, make the offer that works for you and is the offer that you can complete to close the transaction. As a Buyer, be aware that the mortgage interest rates will increase several more times. As a Buyer, if you do not buy now, in the future you will have less opportunity. As a Buyer, be prepared to act quickly.